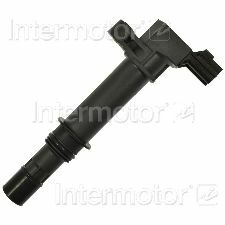 The best discount Ignition Coil OEM Parts. 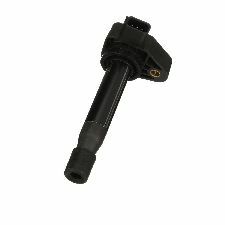 Our inventory is always being updated, searh for Ignition Coil parts for the following makes. 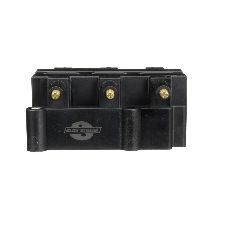 Your Ignition Coil converts low electrical energy from your battery into high powered electrical energy that is used to start your vehicle and ignite your fuel. When should you replace your Ignition Coil? A regular maintenance check on your vehicle will prolong the life expectancy of your Ignition Coil and vehicle. There are a few things that could cause your Ignition Coil to become faulty. High heat temperatures or a lot of vibrations from your vehicle could damage the coil. Faulty spark plugs are the main cause of your Ignition Coil breaking due to overloading them with voltage. Vehicle is loud and struggles to start the engine. Fuel consumption is higher than usual. 100% pure copper windings in primary and secondary bobbins improve durability and provide higher resistance to internal shorts and dielectric breakdown. Electronic ignition module profile and feedback signal ensures proper OE fit, form, and function. Thermoplastic housing withstands heat stress for enhanced durability. Internal core made from grain-oriented electrical steel limits loss factor within magnetic circuit to reduce heat that may reduce coil endurance. Samarium-Cobalt (SmCo) magnet produces max high voltage output at all speeds. Stainless steel spring resists corrosion. Tin-plated brass terminals improve electrical contact and protect against corrosion. High-dielectric epoxy injected into case and pulled into vacuum to eliminate air pockets and prevent moisture intrusion or thermal breakdown. Engineered and tested to match or exceed OE for spark energy output, impedance, and durability. Tested at extreme engine performance condition at 7200 RPM. Advanced thermoplastic coil connector ensures proper connection and resists fractures caused by heat and thermal cycling. High-temp boot prevents high-voltage leaks, while stainless-steel spring provides proper connection with spark plug. High-impact housing material ensures superior bond to epoxy for longer life in all operating conditions. Internal, neodymium permanent magnet core surrounded by grain-oriented, magnetic-laminated steel maximizes high-voltage output at all speeds. Primary (22 gauge) and Secondary (45 gauge) copper wire ensure high-voltage availability for peak performance while reinforced bobbins prevent voltage flashover for extended service life. Copper wires using higher insulation grade ensure heat resistance and prevent high voltage breakdown. Engineered and tested to match or exceed OE for spark energy output, impedance, and durability. Tested at extreme engine performance condition at 7200 RPM. Advanced thermoplastic coil connector ensures proper connection and resists fractures caused by heat and thermal cycling. High-impact housing material ensures superior bond to epoxy for longer life in all operating conditions. Internal core surrounded by grain-oriented, magnetic-laminated steel maximizes high-voltage output at all speeds. Primary (22,5 gauge) and Secondary (43 gauge) copper wire ensure high-voltage availability for peak performance while reinforced bobbins prevent voltage flashover for extended service life. Copper wires using higher insulation grade ensure heat resistance and prevent high voltage breakdown. Optimum wire distribution developed by extensive testing ensures superior functional parameters and durability.